A tour de force of theoretical reasoning, this book presents the most advanced analytical model of the bargaining process so far conceived. 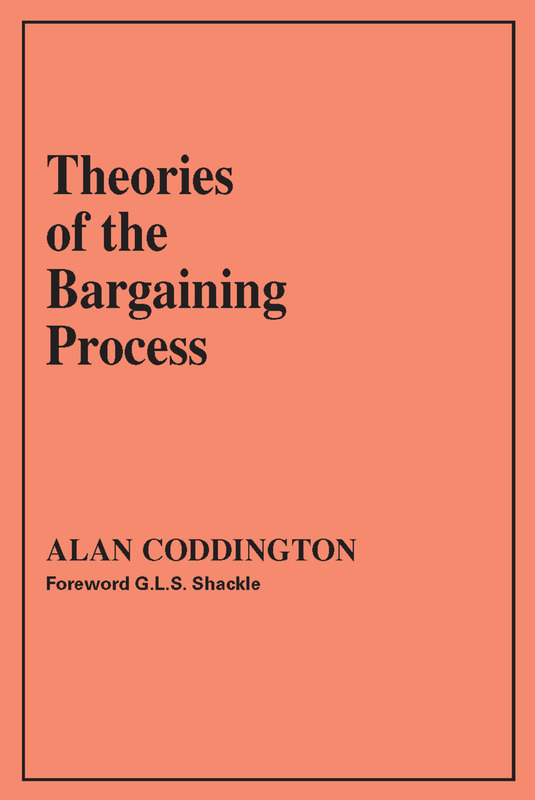 Focused essentially on the dynamics of the bargaining process, Coddington's model employs elements of several conceptual constructs--individual decision-making, theories of expectations and their adjustment, and environment concepts--to explain the nature of consistency in a bargainer's system of expectations and intentions.The book begins with a description of the bargaining process in an economic context and establishes an analytical framework. There follows a critical survey of bargaining theory in which the author selects those concepts, which he finds most valid and most applicable to his decision-making/expectation/adjustment model. The internal consistency of a wide class of bargaining models is then examined in a chapter on the relationship between decision-making and expectations. Since the theory of games has been used as a basis for bargaining process theory, the author devotes a chapter to an examination of the game-theoretic approach and an assessment of its value relative to his own approach.The author concludes with a study of the specific capabilities of his own analytical model, with discussion of the possible combinations of assumptions with which the investigator may work. Although stemming from a problem in economic theory and of immediate intent to economists, the book's contribution to the general theory of conflict process and interdependent decision-making make it an important study for students of politics and international affairs as well as management and labor relations specialists.